Welcome to Marcee Kleinman's Kilimanjaro Journal. Mount Kilimanjaro's name comes from the phrase Kilima Njaro, which means "shining mountain" in Swahili. The mountain is also called Oldoinyo Oibor, which means "white mountain" in Masai. It has been known throughout recorded history for its altitude, since it is the highest point in Africa and the world's highest free-standing mountain, and also for its iconic "snows." The highest point, Uhuru Peak, is on the volcano Kibo. The white cap of glacial ice (which is quickly disappearing due to global warming) is visible from far across the Rift Valley. This web journal is dedicated to the memory of my sweet grandmother, Rachel "Nammy" Katz (January, 1910 - August, 2001) who passed away while I was in Africa. 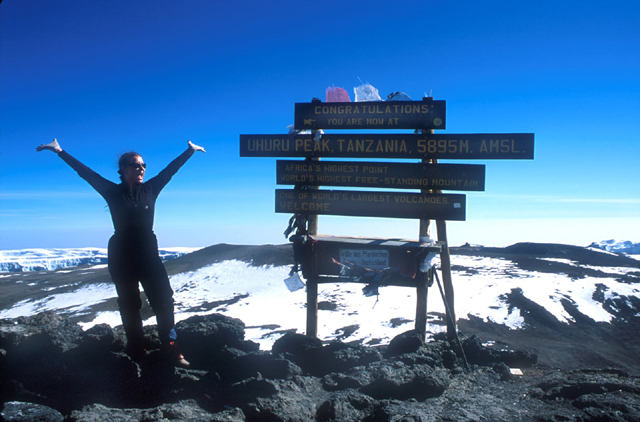 I would like to thank everyone who encouraged me to take this Kilimanjaro trek and who gave me love and support. I would especially like to thank my husband Ken and my children, Jordan, Elana, and Brandon for allowing me to take time out for this once-in-a-lifetime experience.